The struggle to perform well is universal, but nowhere is this drive to do better more important than in medicine. 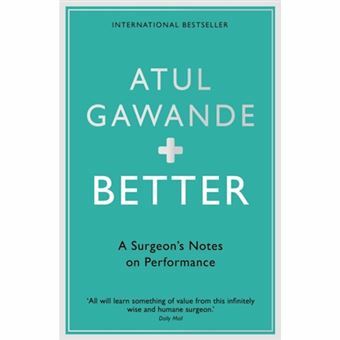 In his new book, Atul Gawande explores how doctors strive to close the gap between best intentions and best performance in the face of obstacles that sometimes seem insurmountable. His vivid stories take us to battlefield surgical tents in Iraq, to a polio outbreak in India and to malpractice courtrooms around the country. He discusses the ethical dilemmas of doctors' participation in lethal injections, examines the influence of money on modern medicine and recounts the astoundingly contentious history of hand-washing. Finally, he gives a brutally honest insight into life as a practising surgeon. Unflinching but compassionate, Gawande's investigation into medical professionals and their progression from good to great provides a detailed blueprint for success that can be used by everyone. The struggle to perform well is universal, but nowhere is this drive to do better more important than in medicine. In his new book, Atul Gawande explores how doctors strive to close the gap between best intentions and best performance in the face of obstacles that sometimes seem insurmountable. His vivid stories take us to battlefield surgical tents in Iraq, to a polio outbreak in India and to malpractice courtrooms around the country. He discusses the ethical dilemmas of doctors' participation in lethal injections, examines the influence of money on modern medicine and recounts the astoundingly contentious history of hand-washing. Finally, he gives a brutally honest insight into life as a practising surgeon. Unflinching but compassionate, Gawande's investigation into medical professionals and their progression from good to great provides a detailed blueprint for success that can be used by everyone.